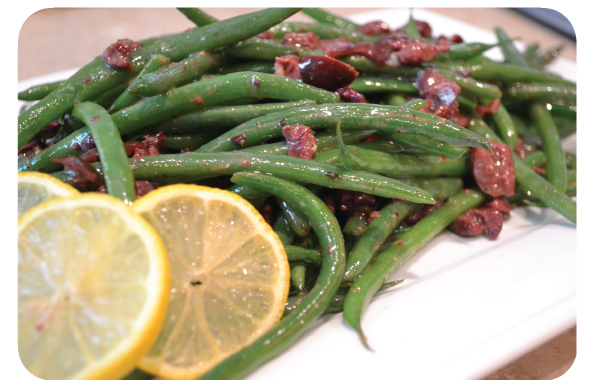 green beans with kalamata vinaigrette | Is there any wine left? I can’t believe I haven’t blogged more about green beans. They are my absolute favorite vegetable! I love how you can toss or top them with so many different flavors, depending on your mood or rest of the meal. And this recipe is so easy, you can make it start-to-finish in 15 minutes. Put the rinsed green beans in a bowl and fill it with a few inches of water. Using saran wrap, cover most of the bowl, but leave part of it open so steam can escape. Microwave the green beans for 6 minutes (in 2 minute increments, stirring with a wooden spoon between each time). You could go a minute shorter or longer depending on how crunchy you like your green beans. Meanwhile, give the Kalamata olives a rough chop and put them in a jar. Make sure you’ve bought pitted olives! Mince the garlic and add them to the olives. Pour the red wine vinegar, lemon juice, dijon mustard, olive oil, salt and pepper in the jar too and give it a good shake to emulsify the vinaigrette. Drain the water from the green beans as soon as you remove them from the microwave. This will help them stop cooking. 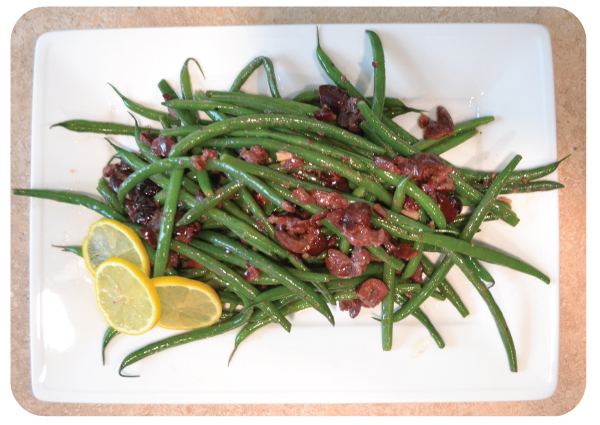 Pour the vinaigrette over the beans and toss with tongs until all of the beans are coated. Taste and add more salt and pepper, as needed. If you’d like, give them a squeeze of lemon juice just before serving. I think this really brightens up the flavor. These are delicious served warm right after the beans are blanched, but taste just as good at room temperature. Makes them great for a potluck or a side dish when bringing dinner to a new mom or sick friend. Place the green beans in a microwave-safe bowl and add 2-3 inches water. Cover with saran wrap, leaving about 1/4 of the bowl uncovered. Microwave for 5-6 minutes, in two minute increments. Remove from microwave and drain immediately. Chop the olives roughly and mince the garlic. Place them in a jar and add salt, pepper, lemon juice, dijon, red wine vinegar, and olive oil. Shake well to combine. Pour the vinaigrette over the green beans and toss to combine. Can be served warm or cold.